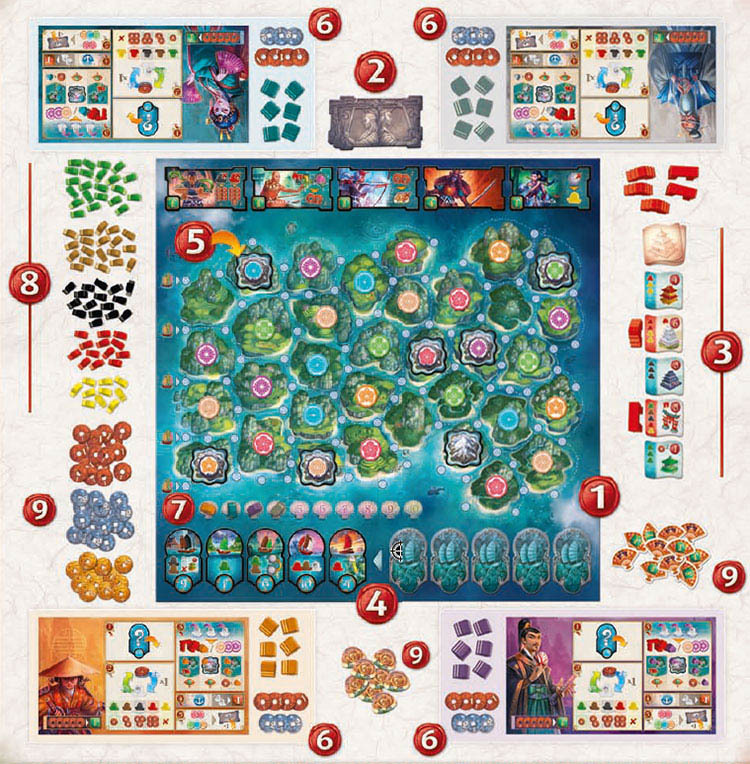 Queen Himiko has tasked every builder in the kingdom with a prestigious mission: build the capital of Yamataï and make it the jewel of the archipelago. Your task: surpass your competitors and build the most prestigious city of them all, using resources from the fleets that travel through the kingdom. Prepare your strategy, recruit specialists, and do whatever is necessary to become the best builder and be rewarded by Queen Himiko for your work. 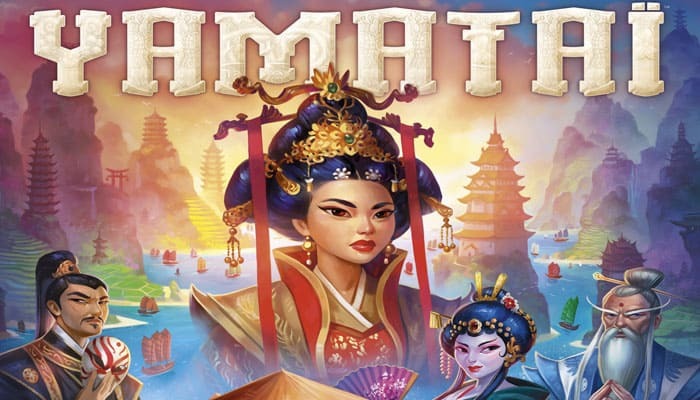 In the end, only one name will be remembered as the greatest builder of Yamataï! Place the main board 1 on the table. Shuffle the Specialist Tiles to form the Specialist Deck. Place this deck next to the board, face down, then reveal the top five tiles and place them on the appropriate spots on the board 2. Shuffle the Fleet Tiles. 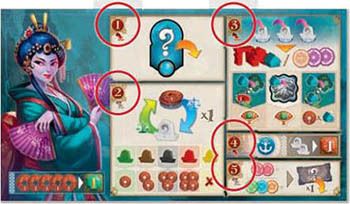 Reveal five Fleet Tiles and place them on the first five spots of the Fleet Track (light-colored spots), at the bottom of the board. Place the five remaining Fleet Tiles face down on the five last spots of the track (dark-colored spots) 4. Shuffle the Culture Tokens and place them randomly on the board, face down. You must place one Culture Token per island. Then, reveal them one by one and place a mountain tile under each mountain Culture Token (even the blank one) before removing the empty tokens from the board 5. Then, shuffle the turn order meeples and place them at random on the first numbered spots above the Fleet Track 7. This defines the turn order for the first round. In a 2-player game, take one meeple per player, shuffle them and place them on spots #1 and #2, then repeat the same order for spots #3 and #4. 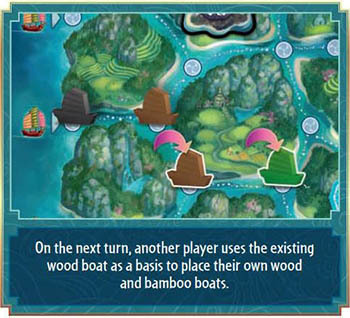 Sort the wooden boats by type and place them next to the board within easy reach of each player 8. The remaining components (Prestige Buildings, Sacred Ground Tokens, Coins and Prestige Tokens) are placed next to the board as well and form the reserve 9. The object of the game is to gain the favor of Queen Himiko by scoring Prestige Points. There are three ways to achieve this goal: collecting money, constructing buildings, hiring specialists... but in the end, only one of you will be declared winner. 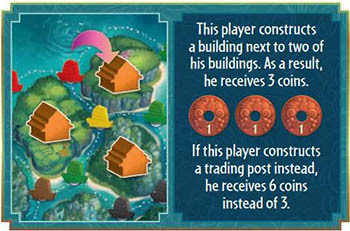 During each round of the game, players follow the meeple order on the Turn Order Track. The rst player will perform the actions #1 to #5 listed on their player mat before the next player takes their turn. Once all players have played their turn, prepare the next round. In a 2-player game, each player plays a complete turn for each meeple of his color. This action allows you to take control of the fleet of your choice. A fleet is made up of boats carrying various resources: the rarest is gold (yellow), then clay (red), stone (black), wood (brown) and bamboo (green). You must choose a fleet from among the visible ones. Place the chosen fleet, as well as your turn order meeple, on your player mat. Then, take the boat(s) depicted on the Fleet Tile from the reserve, provided there are some left (you can store as many boats as you want during this action). If there is no boat left for the chosen resource(_), you do not get any compensation. Each fleet also allows you to use a special power that can be activated at any point during your turn. 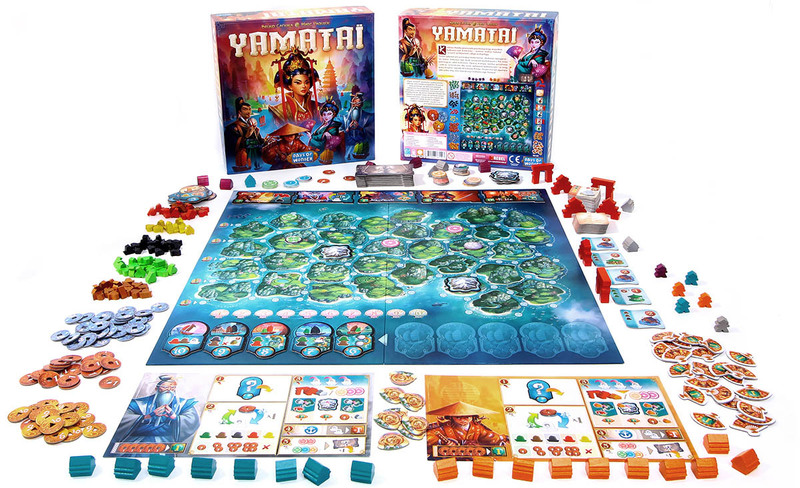 Trade plays an important role in the Yamataï archipelago. Subjects of Queen Himiko buy and sell all sorts of goods to try and complete their buildings. Gold is so rare, though, that no one sells it. You can buy or sell one boat, paying or receiving the price marked on your player mat. 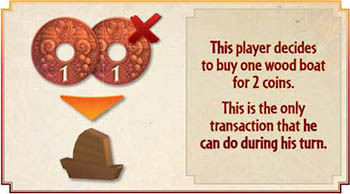 Note: you can only do one transaction per turn (i.e. you buy or sell one single boat). Gold cannot be bought, or sold. Some Specialists allow you to ignore this rule. During this phase, the boats that you chose carry the re- sources to the islands of the Yamataï archipelago. The boats will allow the players to either clear the terrain to collect Culture Tokens or construct a building on an empty island. 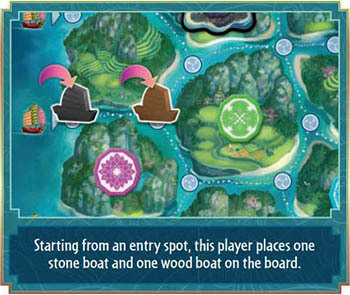 The boats and islands are available to any player. 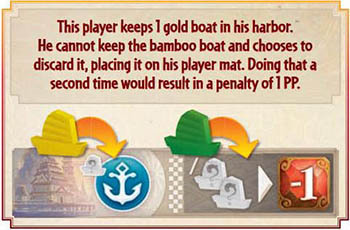 When placing the boats on the board, you must respect the following constraints. or on an empty spot connected to a boat of the same color. Subsequent boats may be placed on any empty spot con- nected to the previous boat (even if it is not the same color) so as to form an uninterrupted chain of boats. or construct a building, which will grant you a reward from the queen. Choose one of the following actions. This action is mandatory unless you cannot complete it. 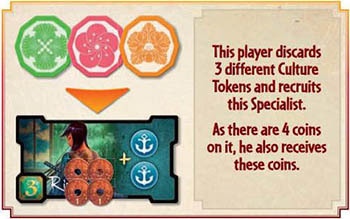 Take one Culture Token for each boat that you placed on the board. 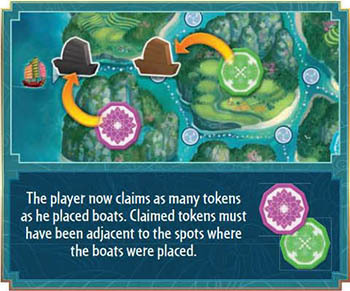 Each boat allows you to take one adjacent Culture Token (or Mountain Culture Token). Choose a building from the face-up row. That building will be constructed on any empty island adjacent to at least one of the boats that you placed on the board during this turn. 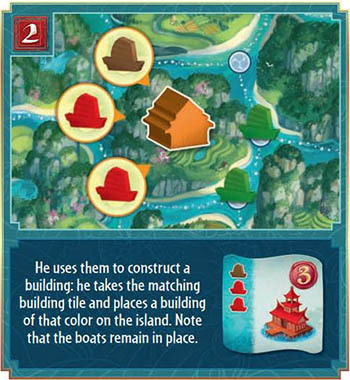 To place a building, the required boats for its construction (listed on its tile) must be adjacent to the island where you chose to build it (even if these boats were not yours, and even if the boats that you placed are not used to build it). Do not remove the boats that you use for the building! Take the building tile and place it face down in front of you. 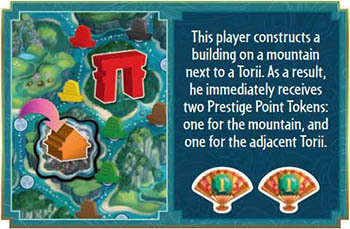 At the end of the game, the building will grant you Prestige Points (PPS). Then, place the matching building on the island: one of your Standard Buildings, or a Torii or palace, if the building that you constructed was such a Prestige Building. Buildings grant you money and prestige! if constructing a building starts or increases a group of buildings of your color (you need at least two buildings to form a group, a single building is not considered as a group), take 1 coin for each building of this group, including the one you just built. To be considered contiguously adjacent, buildings must share a border. A corner is not a border and thus does not make two buildings adjacent. To form a group, all buildings do not need to be adjacent to each other: a chain of buildings is also considered a group. Torii and Palaces are special buildings. They are not affected by Standard Building bonuses. However, each Standard Building placed next to a Torii or palace scores 1 extra PP when constructed (but only after the Torii or palace was constructed). This bonus is cumulative with any other bonus. 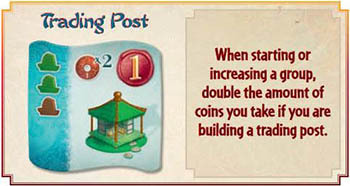 Note: you can only construct one building per turn. Unused boats must now be placed on your player mat. 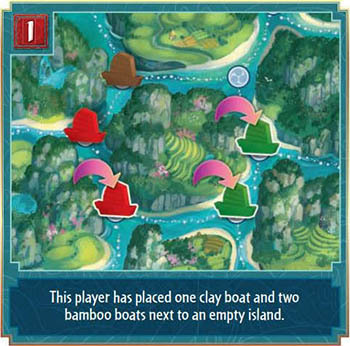 Place the boats that you did not use on your player mat. The harbor location on your mat allows you to keep one boat for future turns (one of the Specialists can upgrade this capacity). The other boats must be put aside and can no longer be used. At the end of the game, you will lose one prestige point for every two boats put aside, regardless of color. Specialists can help you receiving the favor of Queen Himiko. If you off er them gifts, that is… You can recruit a Specialist from the Specialist Track by spending two identical Culture Tokens, or three different Culture Tokens. When you recruit a Specialist, you also collect the coins that were on his card. You can only recruit one Specialist per turn. Once recruited, a Specialist remains with you until the end of the game. #Add two coins on every face up Specialist at the end of the round (even if there were already coins from previous rounds on them), then replenish the Specialist track with new tiles if needed. If you can't complete the Specialist track, the game is over. Draw new building tiles from the deck (if needed) to have 5 building tiles visible. If you can't draw a new building, the game is over. On the turn order track, each player places their meeple on the number matching the fl eet they have played this turn. In a 2-player game, each player places their two meeples on the two matching numbers. Slide the hidden Fleet Tiles to the left side of the Fleet Track. Reveal the tiles that are on a light-colored spot; you should now have a total of fi ve visible Fleet Tiles. ed and placed face down on the rightmost spots of the Fleet Track. A new round then begins. A player places their last Standard Building. (in that case, you fi nish the current round, then the game ends). There is no boat of one color remaining when setting up a new round. You cannot replenish the Specialist Track during the preparation of next round. You cannot replenish the Building Row during the preparation of next round. 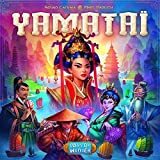 The player with the most prestige points is declared the Great Builder of Yamataï and wins the game. In case of a tie between two or more players, the player who played first on last round wins the tie.